Fujitsu Limited has yesterday signed a Memorandum of Understanding (MoU) with PT. Telekomunikasi Indonesia, Tbk. regarding a two-year strategic partnership, in which they will pursue the co-creation of digital businesses that leverage advanced network infrastructure in Indonesia. Based on the MoU, the two companies will move forward to apply cutting-edge technologies, such as the Internet of Things (IoT), to various fields, including smart cities, healthcare, manufacturing and logistics. Their joint initiatives will start from market research, planning and review of digital solutions that utilize the companies' respective strengths, and based on this groundwork, the development, verification, and co-creation of digital businesses. The prevalence of smartphones and broadband networking that enables high-capacity communications have in recent years led to an enormous expansion in Internet usage in Indonesia. Being a country with a population of over 250 million, even further growth in the digitalization of society as a whole is expected. 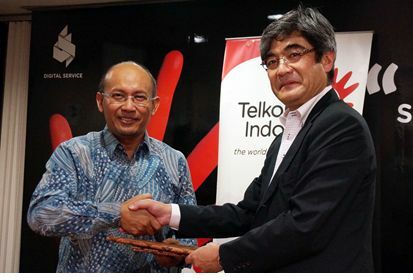 Now, working toward this development of Indonesia's digital society, Fujitsu, which continues to provide information and communication technology (ICT) solutions worldwide with the knowledge cultivated from 80 years of experience in network systems, and Telekomunikasi Indonesia, the largest telecommunications services company in the country, have agreed to co-create digital businesses.